Add some personalized character to your kitchen with this adorable crochet textured dishcloth pattern. Made with 100% cotton yarn, these dishcloths provide the durability you need to tackle tough messes! This post contain’s affiliate links. For more more information please see my disclosures here. Hello, and welcome back to the blog! 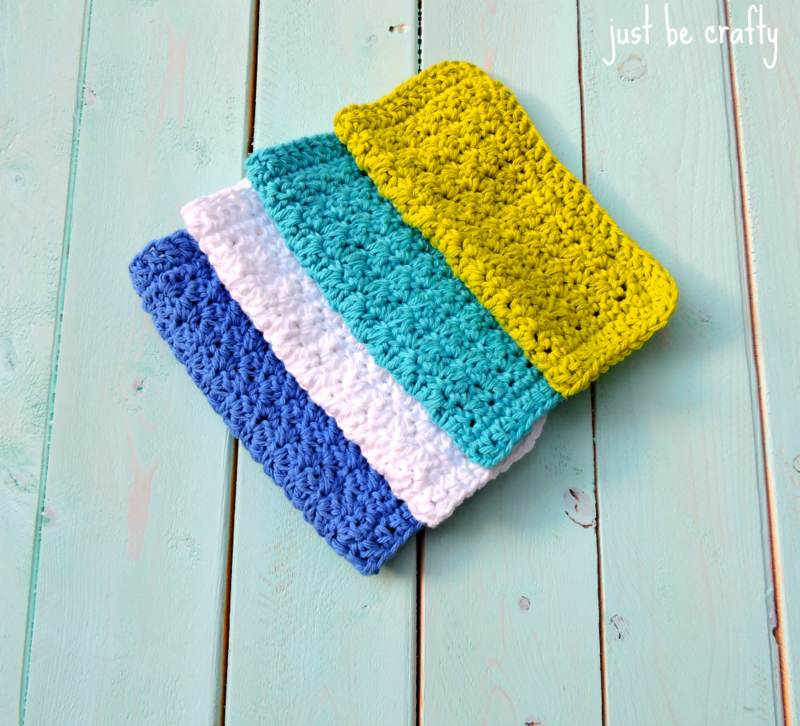 I’m super excited to share my first crochet dishcloth pattern design with you today! The dishcloths are made with Lily Sugar’n Cream yarn… my absolute favorite yarn for dishcloths that I have come across so far. 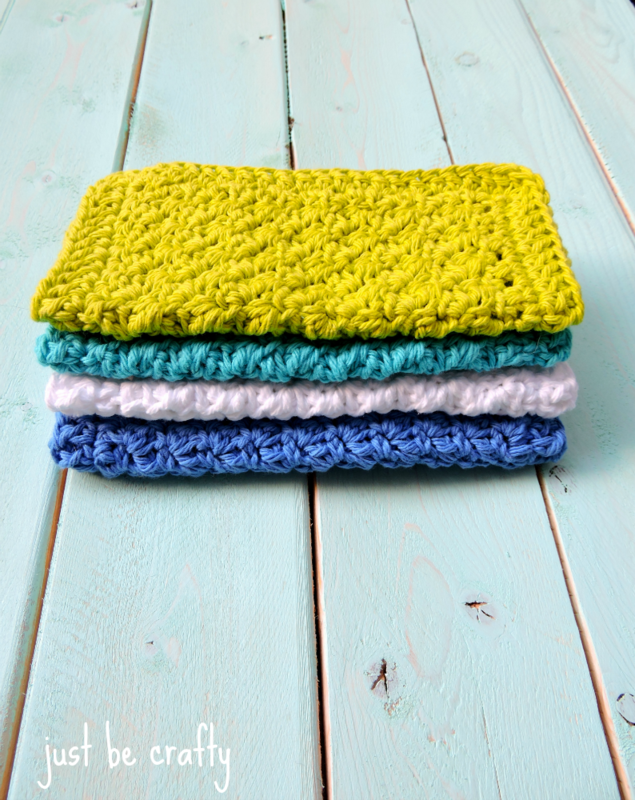 The texture created from the combination of crochet stitches makes a thick and thirsty fabric that’s perfect for a dishcloth OR facial washcloth. And, the nice thing about them is they look kind of complicated (but aren’t at all! :)) AND they whip up pretty fast! See below for how to make your own! A printable PDF version of this pattern is available for purchase here in my Etsy Shop. Row 1 – In 2nd ch from hook, make a sc, and dc in next ch; keep alternating sc and dc in each ch until you reach the end of the row; ch1 and turn. Row 2 – skip the 1st stitch, sc AND dc in next stitch, *skip a stitch, sc AND dc in next stitch; repeat from * to the end of the row; ch 1 and turn. Round 1 – beginning with the ch 1 from the previous row, make 3sc in the first stitch, sc across until you reach the last stitch, make 3sc in the last stitch of the row. Sc along the side of the dishcloth making 17 stitches evenly along the side edge. Once you reach the bottom edge, make 3 sc in the 1st stitch along the bottom edge and sc in each stitch across the bottom until you reach the last stitch of the bottom edge, make 3 sc. Sc along side of dishcloth, making 17 stitches evenly across the side. Once you reach the end, join with the 1st stitch of the round. Round 2 – ch 2, dc in same stitch as the ch 2, and 3 dc in next stitch (this is the corner stitch), dc in each stitch until you reach the next center corner and make 3dc. Repeat this process to the next two corners until you reach the end, and join with the first dc of the round using a slip stitch. Cut yarn and weave in all ends! 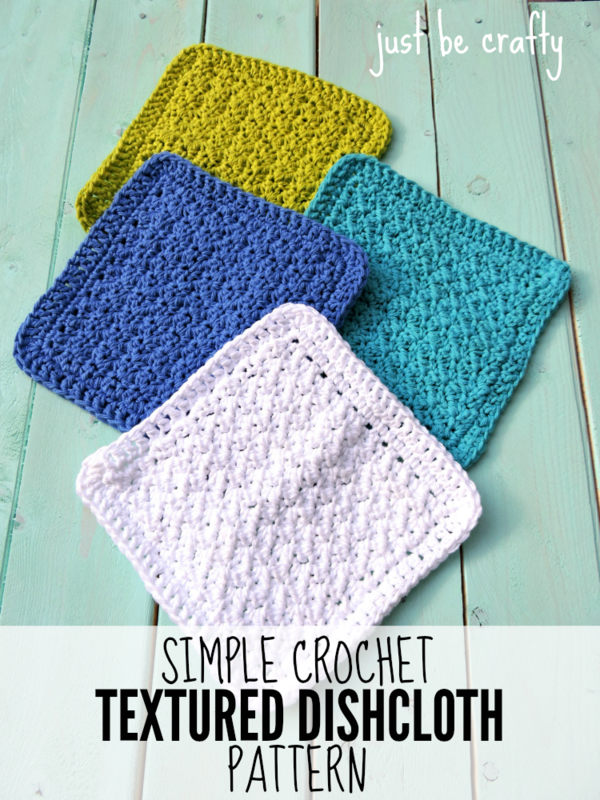 Do you think you’ll give the crochet textured dishcloth pattern a try?! Let me know in the comments below! Thank you for a great pattern and easy to follow instructions. Made a longer version as a kitchen towel for my mother in law….my first! Really like the texture and will be revisiting your tutorial in the near future. Hi Lori! Thank you for your comment! I am really glad you enjoyed the pattern! I am sure your mother in law loved it, and that’s awesome you made it into a kitchen towel! Great idea! 🙂 Happy Crocheting! Beautiful pattern that is very easy to work up! Thank you so very much for sharing! I really like Lily Sugar n’ Creme yarn and this is the perfect pattern to use it on. Works up very quickly! Hi Kristine! Thank you so much, I’m so happy you enjoyed the pattern! I would LOVE to see your finished dishcloths! If you’re on Instagram, feel free to share your pics and use the hashtag #justbecrafty or upload them to the Just Be Crafty Facebook page (link at the top of the page)! Thank you so much for this pattern! The texture is perfect while still remaining quick drying! I have had so many people request dish cloths lately- you just can’t buy them like this anymore! They only took about an hour to work up (the yarn was a bit stiff). I was up until 2am because I just couldn’t stop! Thank you!!!! Hi Maggie! Thank you so much for your comment, I am glad you enjoyed making them!! Your recipients will love them :). And yes they are addictive and perfect for late night Netflix watching :). I love this pattern!! So easy and great for Christmas gifts. Thank you! Hi Brittney! Awe, thank you! I am happy you are enjoying the pattern! Your pattern is lovely. Did each cloth use an entire ball of yarn? I have several balls of Lily’s Sugar and Cream that aren’t full balls, so I am trying to judge whether I will have enough before I start. Hi Vicki! Thank you so much! I can get at least two dishcloths per skein. omg love this pattern. I just found it and found it very easy to understand the direction. I like how the wash cloth looked when I had it done. thanks so much for the pattern. Thank you. Easy pattern, easy to follow since I’m learning. Hi, I seem to be getting it wrong! When I get to the end of a row, there is still one stitch there , I would think the last crochet should be on the last stitch? So my edge is jagged. Please help! Hi Kate. I am replying to your question because I too am having this problem. I found this pattern last evening and have ripped it out four or five times now. I am not a newbie to this but I can’t seem to make my stitches come out even. As I continue with my rows it becomes narrower in width. Maybe someone can help us out. Happy crocheting to you. P.S. Thank you Just Be Crafty for this pattern. I really do like the pattern this makes. Thank you Brittany. I always seem to do better when I see a tutorial/video when attempting a new pattern. This is not difficult but I am not coming out even. I finished the whole cloth with borders and decided to rip it one last time because I just thought it looked wonky, and I thought I could do better. This will be a pattern I will use a lot for myself, daughter and daughter in law so I do want to get it right. I did notice that the last stitch could be difficult to see but it is the skipped stitch so I did not think it belonged there. I will not give up on this as I was looking for a new dishcloth pattern and I’m determined not to let this get the best of me. Lol. Thanks again! I love making this dishcloth. I also used this pattern into a disgusting towel. I can’t quite making these dishcloths. I always want something to give to family aND friends. Thank you so much. I’m a newbie crocheter and would love to see a video tutorial of this. Are you still planning on making one? Hi! I just finished the last washcloth for my set of these, and wanted to thank you for sharing such a wonderful pattern. This pattern had it all, it was fun, easy, pretty, and practical. The best part was how quickly they worked up. I could easily finish one while my baby napped. I can’t wait to gift these at my family’s Christmas this year. I have a difficult time reading patterns but yours was very easy to understand and love the texture ? Thank you so much Annie! I am glad you liked the pattern :). I made a total of 12 of these wash cloths to give to my daughters and my family in North Carolina. So easy and I love them. Awesome! I’m so glad you enjoyed the pattern! They are pretty addictive 🙂 Your daughters and family will love them! Hello! i’m new to crocheting and I noticed that the gadge after completing it was off. Mine turned into 7X9. I used a 5.0 mm hook and the type of yarn you suggested. Do you have any thoughts on why that could be? I also had a hard time counting the rows. I’m not sure what to count-the holes? Its kinda hard to see. Any advice would be greatly appreciated as it is a beautiful pattern! Thank you! Hello! Thank you for responding! The pattern I was doing was the textured dish cloth? Haha sorry about that! I was talking about a completely different pattern! If your dishcloth ended up too tall, you might have added a couple extra rows. To help keep track of your rows, it might be beneficial to mark each row on a piece of paper as you go. 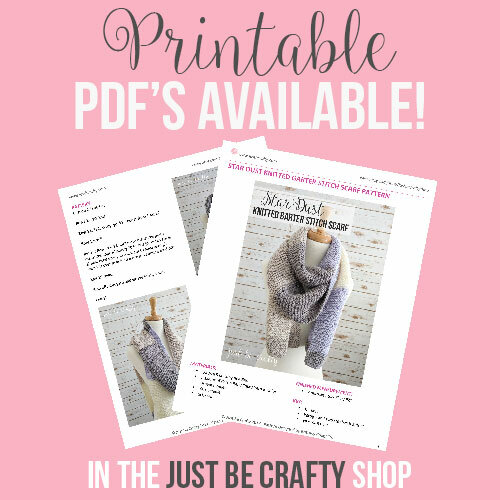 Here is a link to a post with two free printables for keeping track of your rows/rounds (https://justbcrafty.com/2017/02/keep-track-of-your-knitting-crochet-project-and-never-lose-your-place-again-free-printable.html). 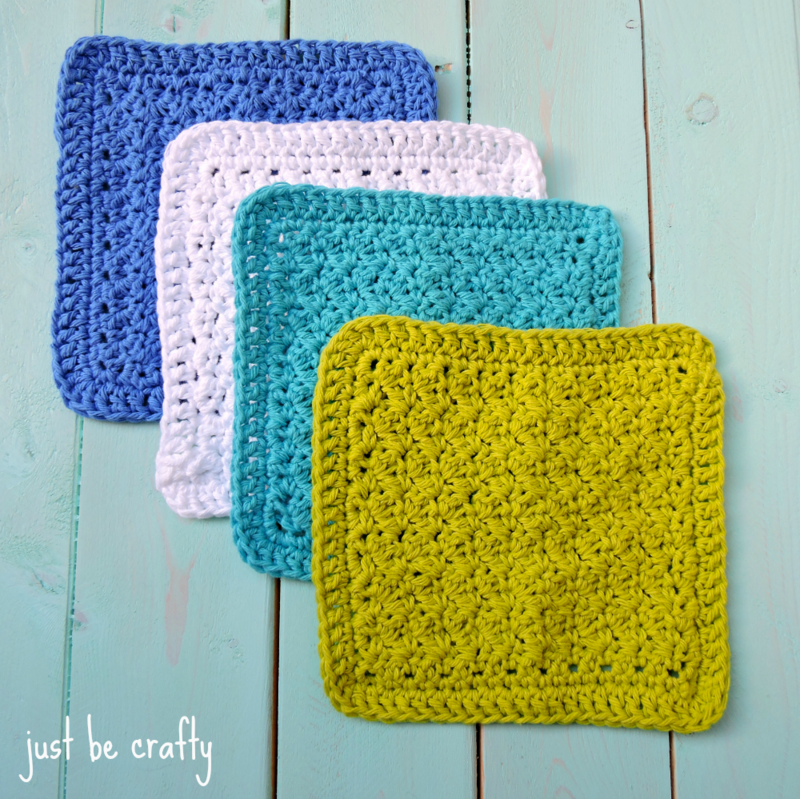 I also link to my video tutorial in the post where I show step by step how to crochet the dishcloth. I hope this helps! When you chain 2 and 2 dc in the 2nd round then 3 dc in the next isn’t that 6 in that corner and 3 in the other corners? Hi Penni! The ch 2 in round two does not count as a stitch. You’ll make 1 dc in the same stitch as the ch 2 to start the round. This stitch is one stitch before the corner. You’ll make 3 dc in the next stitch – which is the corner stitch. For further instruction feel free to check out my video tutorial linked in the post.